007 DVD Copy is a software to backup your precious DVD Video Disk to DVDRW disk without any quality loss. It can copy any DVD video (D9 and D5) on to your DVD disc (4.7GB/Single Layer or 8.5GB/Dual Layer) without loss of content or quality. It copys all existing DVD contents including whole movie,language tracks, subtitles, and etc. 007 DVD Copy has an user friendly interface, anyone can master it within 5 minutes. 007 DVD Creator is an easy-to-use and high speed All-in-One DVD creator and DVD burner. It can converts ALL formats of video files directly to DVD disk, including DivX, Xvid, AVI, MPEG, WMV, QuickTime, Real Video format, etc. With only a few clicks, you can convert your internet video collection to a DVD±R/RW disk and then replay your collection on your home DVD player/car DVD player. Share your collection with your family, your friends on TV. It supports both NTSC and PAL TV standards. It supports both 4:3 TV and 16:9 widescreen TV. It already includes DVD encoder and DVD burner. You don't need any other software to make it work. 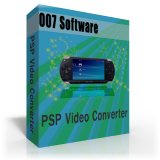 007 PSP Video Converter can convert all video formats to PSP movie and music. It is really easy to use for novices and professionals. The 007 PSP Video Converter supports all most of formats on the internet such as AVI, WAV, MPEG, RM, DIVX, MOV, ASF, etc. Except for that, it also can convert these videos to audio files such as PSP AVC, MP3, WMA, PSP MPEG-4, etc. 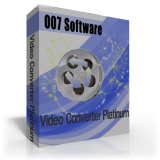 007 Video Converter Platinum is incredibly easy to use for both novices and pros alike. 007 Video Converter Platinum has all the capabilities to give you a product with outstanding quality, convert videos of all popular formats like AVI, MPEG, WMV, DivX, MP4, RM, MOV, XviD, 3GP, etc. 007 3GP Video Converter can convert all popular video formats to various mobile supported formats like 3GP, 3G2 and MPEG-4. It is convenient and simple to use. The 007 3GP Video Converter supports all most of formats on the internet such as AVI, WAV, MPEG, RM, DIVX, MOV, ASF, etc.